ORCID is a digital identifier developed by the international researcher community with which a researcher can be identified clearly, quickly, and easily. ORCID is a non-profit organization which aims to create an international researcher identification system which can be used by researchers, scientific publishers, funders, and organization administrations alike. Uniarts Helsinki is a member organization. ORCID iD identifies you persistently, and ensures your research outputs and activities are correctly attributed to you (e.g. changes in your affiliation do not affect your ORCID iD). It automates the movement of information between you (and your activities and publications) and various systems used by publishers, funders, organizations and other services. Many publishers and funders have already integrated ORCID iD to their systems and processes, and have started to mandate it from researchers. It only takes a moment to register for an ORCID iD. See instructions below. Find out more about ORCID iD on ORCID's pages or the Finnish researcher identifier website (in English). Registering your ORCID iD should take less than one minute. You own your ORCID record and, after registering for it yourself, you will be able to update or add information or give other systems permission to do so. Below is more detailed information about the registration. First name: Your given name, or the name you most commonly go by, is a required field. Last name: Your family, surname, or last name, is not a required field, as ORCID is a global service and supports many naming conventions, but you should always include it if you have one. Primary email: Your primary email address. You will use your email address (or ORCID iD) with your password to sign in to ORCID. Additional email: It is strongly recommended that you provide at least one additional email address on registration. This will ensure you can still use your ORCID record if you lose access to your primary email (after e.g. changing jobs). You can use any email address connected to your ORCID record, with your password, to sign in to the ORCID Registry. An account already exists: You will see a warning message if your email address is already associated with an ORCID iD. You cannot create a second account using the same email address. Reset your password to restore access to the account. A deactivated record exists: If your email address is associated with a previously deactivated ORCID record, you can request a link to reactivate the account at the email address(es) on record. Learn more about deactivating an ORCID account. Password: A password of your choice. Must be at least eight characters long and contain at least one number and one alphabetical character or symbol. Only passwords rated as "Good" or "Strong" will be accepted by the system. Consider using a password manager. Visibility settings: Select your default visibility setting. ORCID recommends choosing Everyone or Trusted Parties as your default visibility setting as this will enable your information to be shared with the systems you interact with. Learn more about visibility settings. Notification settings: Choose what kind of messages and how often you wish to receive from ORCID. You can change this preference after registration in your account settings. Human confirmation: Confirm that you are not a robot by completing the reCAPTCHA. In most cases you will be taken to your new ORCID record, but sometimes, if one or more records with an identical name already exist in ORCID registry, you will be shown a list and prompted to check that none of them are yours. 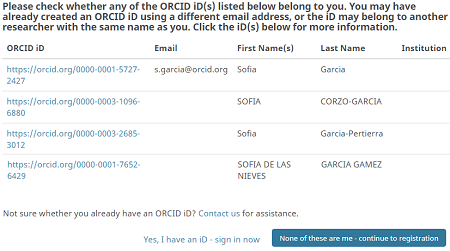 If you have never used ORCID before, then it is very unlikely that any of the listed individuals are you and you can click the “None of these are me – continue to registration” button to get your ORCID iD. After submitting you will receive a confirmation email to verify your email address (also check your spam or junk folder). Works are your research outputs, including publications, data sets, conference presentations, and more. While it is possible to add works manually, ORCID recommends that you permit trusted organizations to add/update this information to add and update them for you - look for the green iD icon next time you submit a paper, book chapter, or book. Allowing trusted organizations to add information to your record ensures the data connected with your ORCID iD is authoritative and trustworthy, as well as saving you time entering information manually.